Marie Hull-Brown, 83, worked as a a London policewoman. 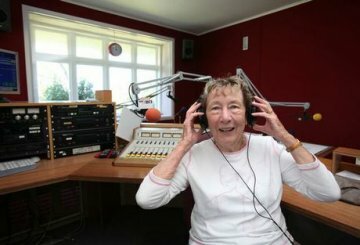 A fresh way for older Aucklanders to air personal stories has been acclaimed at a social development forum. Rebecca Blithe listens in. She's dodged bullets fired from a fighter plane, endured the bombing of her home and seen her mother's face lacerated by more than 100 shards of glass. As a 21-year-old policewoman she patrolled London's tougher streets armed only with a whistle. These are snippets from the life of 83-year-old Marie Hull-Brown, now of Rothesay Bay, as shared with 16-year-old Perry Wilton on Days of the Future Past, a new radio show on Auckland's Planet FM. Aiming to bridge the gaps between generations and build a record of Aucklanders' lives, Perry and Mrs Hull-Brown interviewed each other about growing up in different eras. "As a kid growing up, you don't really think about older people and what they might have experienced," says Perry. "It was really interesting. There are such massive contrasts." Mrs Hull-Brown was equally enthused and impressed by her young interview subject. "He seemed most interested that we didn't carry radios. If you needed help, you'd have to blow a whistle and hope somebody would come to your aid. Usually, it would be a member of the public. Sometimes there'd be another copper (police officer) nearby." Perry says learning about Mrs Hull-Brown's experiences as a policewoman working with such a limited form of communication was a real eye-opener, as was learning about her childhood in World War II. "Man, it's a really different world," says Perry. "That sort of thing's just so hard to relate to." The pair discussed changes in communication technology and, inevitably, Facebook featured in their conversation. Last week, the programme's concept was presented at a Ministry of Social Development forum by Joan Lardner-Rivlin, chair of Planet FM's board and member of the ministry's Older People's Reference Group. "People came up to me afterwards telling me how great it sounds," says Mrs Lardner-Rivlin, who devised the programme with Lucia Davies, Auckland Council's community services advisor. By talking to Auckland women, Mrs Lardner-Rivlin says she has uncovered a store of untold tales. "We're getting a window on Auckland at this moment and we can archive it." Perry has offered to interview other grandparents whose grandchildren live overseas. "The more of these that people can be involved in, the more misconceptions will fade away." Mrs Hull-Brown agrees the programme can help change negative perceptions of older people. "Old people are not past-it old so-and-sos, or old farts, as I've heard before." Days of the Future Past is on Planet FM Community Radio 104.6FM every Monday at 4.20pm. To listen online, go to: www.planetaudio.org.nz/daysoffuturepast. © The Aucklander November 27th, 2010. This material remains © APN Holdings NZ Limited 2013 and is only to be used for non-commercial personal or research use. Any other use requires permission of the copyright holder. "When a radio comedian's program is finally finished it slinks down Memory Lane into the limbo of yesteryear's happy hours. All that the comedian has to show for his years of work and aggravation is the echo of forgotten laughter."